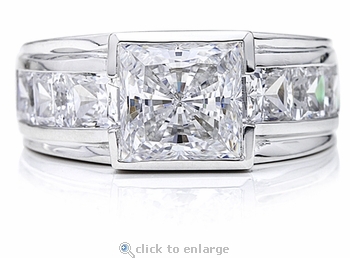 The Semi Bezel 2.5 Carat Princess Cut Cubic Zirconia Channel Set Man's Ring is a handsome ring that features a 2.5 carat 8mm brilliant princess cut center stone. 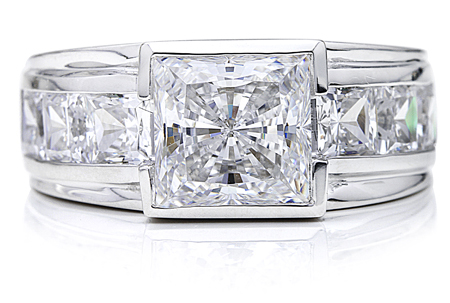 The princess cut square center stone is set in a semi bezel setting that really shows off and sets the stage for the main stone in this men's ring. 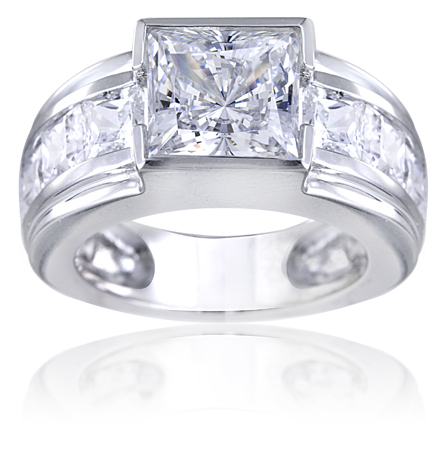 The sides of this gentleman's ring has a single row of masculine proportioned lab created man made diamond simulant princess cut square stones that add a striking glow of brilliance. 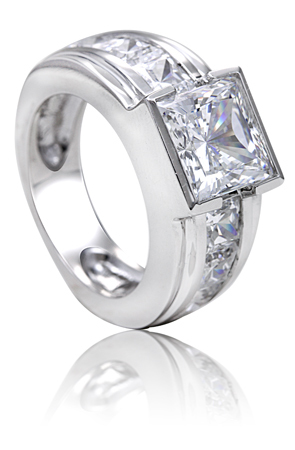 The total carat weight is approximately 4 carats of the finest hand cut and hand polished Russian formula cubic zirconia set in a solid 14k white gold mounting. This cubic zirconia man's ring is a must have for every man who loves to wear jewelry and has a propensity for detailed accessories. For further assistance, please call 1-866-942-6663, option 2. For immediate assistance you can contact a knowledgeable representative via live chat. This item is a Clearance Item and a final sale item.